CIAD’s adult home organizing staff are among the only advocates who regularly visit adult homes and adult home residents in the city. CIAD believes that the key to changing the adult home system requires moving from a system of treatment and management and towards a system of empowerment, rehabilitation and recovery. In redefining the system, we must create and fund supportive housing models -- ensuring access to appropriate housing remains a critical step to a different future. April 2002 The New York Times publishes a series of Pulitzer Prize winning, front page investigative reports, "Broken Homes", by Clifford Levy. The New York State Coalition of Adult Home Reform is established, led by the Schuyler Center for Analysis and Advocacy, NY Association of Psychiatric Rehabilitative Services, Mental Health Association of NYS, and CIAD. June 2003 Disability Advocates, Inc., MFY Legal Services and other legal groups sue New York State, claiming the state is in violation of the Americans for Disabilities Act. We document the barriers adult home residents face when applying and competing for scarce housing. 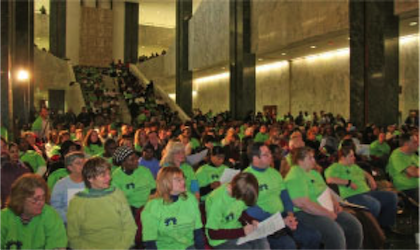 January 2008 The Campaign for Mental Health Housing organizes the largest mental health rally ever held in New York, with over 1,500 people attending. Independent Case Management is installed in 12 homes in 2003. OMH releases assessments in 2006 that shows that of 2,600 residents assessed, over 500 residents are ready, willing and able to move. 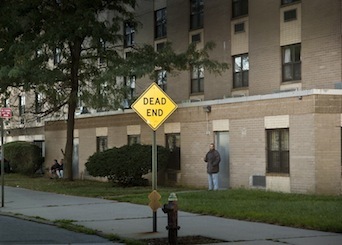 2009 As a result of CIAD and NYSCAHR advocacy, 60 NYC adult home residents move to scatter-site apartments, funded by a NYS Legislative initiative in 2006. On September 7, 2009, Federal Court Judge Nicolas Garaufis rules that New York State is in violation of the Americans with Disabilities Act by illegally segregating adult home residents with psychiatric disabilities in large adult homes. On March 1, 2010, Judge Garaufis releases his final remedy plan. New York State appeals the decision two days later. April 2012 The NYS Court of Appeals overturns the federal court's decision on technicalities. March 2014 A settlement between New York State and the plaintiffs in O'Toole v. Cuomo is approved by the federal court. November 2010 CIAD and ally organizations hold a rally in front of Governor Paterson's midtown NYC office to demand he uphold the federal court's ruling. CIAD conducts a 9 week Peer Advocacy Training for 15 former and current residents to help educate and support other residents during implementation of the court order. Identify and overcome barriers in the process. Helped obtain beds to replace the cots that Belle Harbor Manor residents had been sleeping on for months. Alerted the State Health Department about unsafe conditions at an adult home where residents had sheltered in place. We documented residents' experiences in a participatory research project conducted with the help of students from the Columbia School of Social Work. Download our Sandy Policy Brief. We then made recommendations to New York City and New York State about how we can best prepare to keep residents safe when the next disaster strikes. To many residents, the Department of Health (DOH)--the agency that licenses and regulates adult homes--is an inaccessible and unknown entity. Because of the lack of information, residents are unable to bring up serious concerns about conditions in the home to the proper authorities. While DOH conducts an in-person inspection of all the homes on an annual basis, and is required at this time to speak with residents, most residents are unaware of the inspection as an opportunity to speak directly with inspectors. In some cases residents are even fearful that the inspectors are there to inspect them or shut down the facility and render them homeless. To facilitate better communication between residents and DOH, CIAD members worked to reform the inspection process. CIAD's media team created a training video for inspectors titled "Who Was That Guy? ", which conveys the mis-perception that many adult home residents have about the inspection process and offers suggestions for better communication. The video was shown to adult home inspectors across the state and played a strong role in facilitated discussion between inspectors and residents about improvements that could be made. We have also published a brochure with the New York State Health Department that explains the inspection process to residents and how residents can participate in the process. Follow this link to the Health Department's website for the brochure: When Your Home Is Inspected. CIAD worked with adult home residents to ensure the provision of air-conditioning in resident rooms. For the many frail elderly and individuals taking psychotropic medications, heat can be deadly. Many residents living in adult homes are highly susceptible to heat illness or heat stroke. In the summer of 2005, CIAD launched a series of public meetings, released a documentary titled "Dying for Air: the need for Air-Conditioning in Adult Homes", and vigorously rallied the press. Through our efforts, a strong team of legislators (including Assemblyman James Brennan, Senator Marty Golden, Assemblywoman Audrey Pfeffer, and Senator Diane Savino) met with the Department of Health and CIAD to collaborate on a policy initiative that would address the issue. Since then, severeal million dollars were spent by the state to air-condition resident rooms. Most adult home residents rely on federal and state benefits such as Supplemental Security Income (SSI) benefits or Social Security Disability Income(SSDI) as their main source of income. Most of this money is used to pay for the cost of living in an adult home. What’s left is called their Personal Needs Allowance (PNA), now a $193 per month that is meant to cover the cost of clothing, toiletries, transportation, snack, personal care, and entertainment. 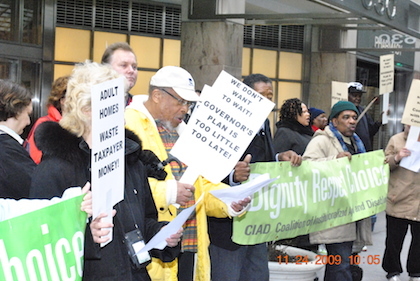 Considering the high cost of living in New York and the limited funds available to many residents of adult homes, CIAD fought for a raise in the PNA. Because of continued pressure by adult home residents working with CIAD and with the assistance of coalition groups such as the New York State Coalition for Adult Home Reform (NYSCAHR) and the New York Association of Psychiatric Rehabilitation Services (NYAPRS), residents won a increase. New York State raised their portion of the SSI check by $15 starting January 2006, and put in an additional $14 in January 2007.